A good coffee shop is an important thing. Important for secret meetings to talk about writing with older boys. Important for—praise be—the only poetry reading in town. Important for everyone else too. Important for legendary bathroom graffiti and important for brioche the size of your head. Important for the cat whose life’s work is sipping cream from tiny stainless pitchers. Important for sitting with sisters, for stretching an hour or so spent laughing at the classifieds over months between visits. Important for the waitress who gets your name wrong so often and with such conviction that you’re sure she’s doing it on purpose. Important for ragtag rows of cake stands and what they keep: a quince-studded vanilla cake set to “buckle” under a mountain of pistachio ginger streusel. Adapted from The Blue Bottle Craft of Coffee, a book about a coffee shop. Preheat the oven to 350 degrees and generously butter a 9-inch spring form pan. 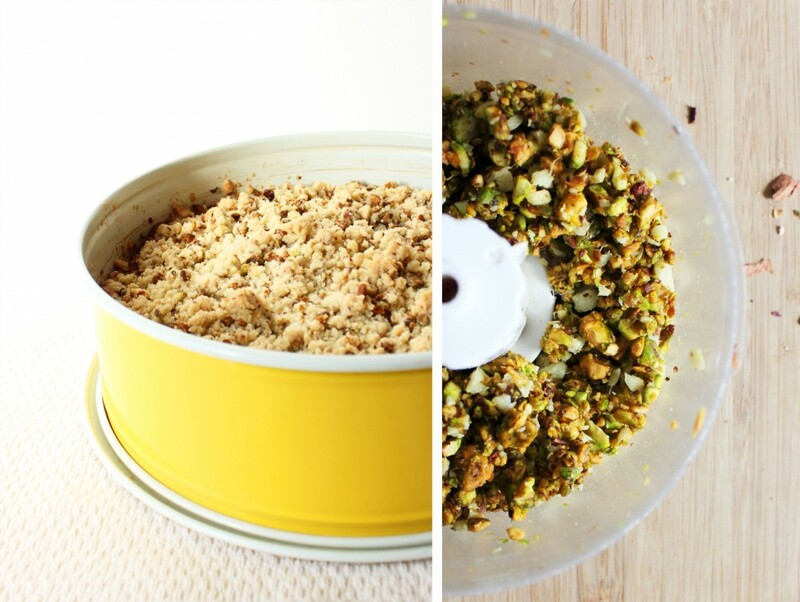 To make the streusel: Combine the pistachios and ginger in a food processor and blend until a very coarse meal forms. Dump into a medium bowl and stir to combine with the next four ingredients. 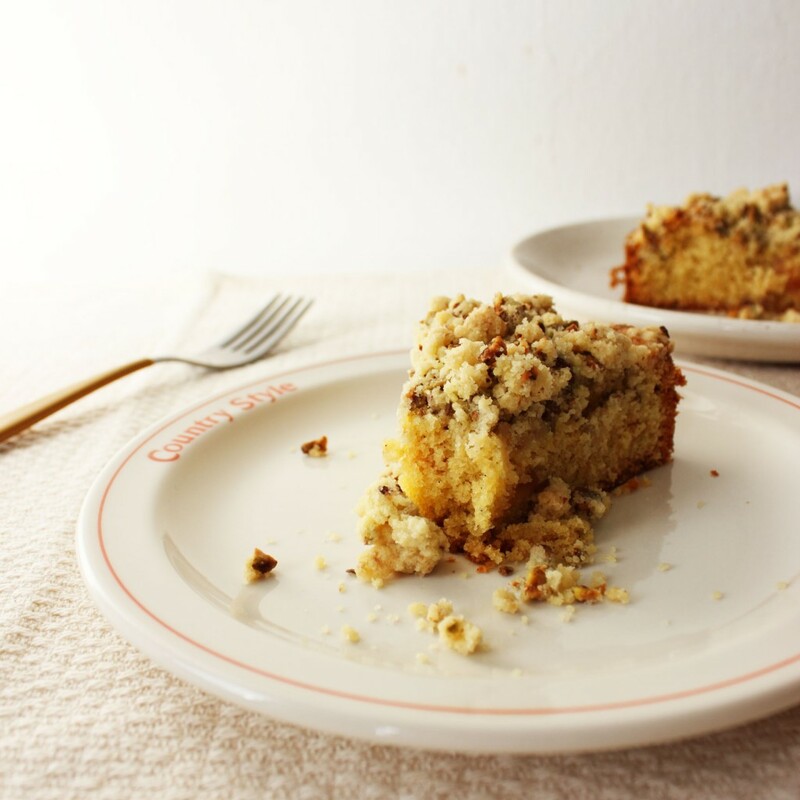 Chop the 6 T of cold butter up, place it in a bowl with the dry streusel ingredients, and let it sit while you make the cake. Don't fully combine it just yet. To make the cake: Cream the butter and sugar until light and fluffy, about 3 minutes. Add the eggs one at a time, beating until fully combined after each addition. Add the vanilla bean seeds and mix well. Add the flour, xanthan gum, and baking powder, mixing until fully incorporated. Spread the cake batter into the pan and set aside. Return to the streusel topping. The butter should be softened, but still cold. 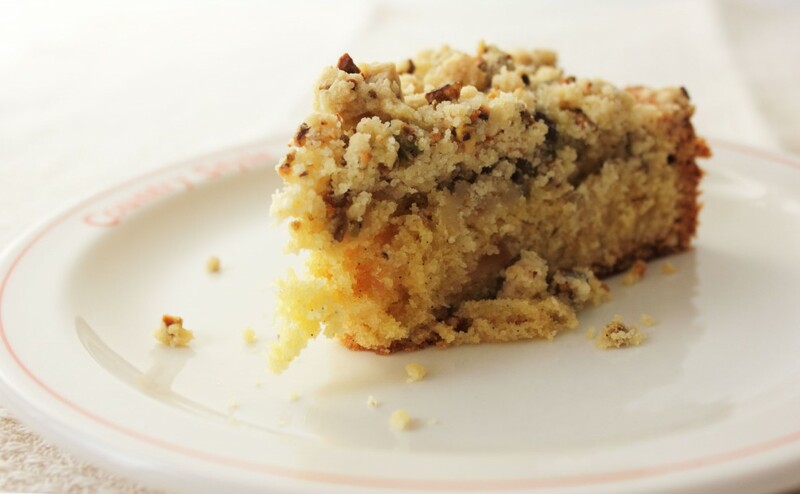 Using your hands, work the butter into the dry ingredients until clumpy crumbs form. Sprinkle the topping on top of the cake in an even layer and bake for 50-60 minutes. Let cool for 10-15 minutes before unmolding from the springform pan. I used Cybele Pascal’s gluten-free flour mix. Gluten-eating folks can sub AP flour by weight and omit the xanthan gum. I quartered and cored a single quince and poached it in 2 cups water, 1 cup sugar, and 1/4 t lemon juice for about 40 minutes. David Lebovitz has a good poached quince recipe too. Quince poaching is a forgiving science. No matter what, save the poaching liquid as it’s the best soda syrup around. I was told last weekend that it’s going to be an iffy year for quince in the mid-Atlantic–noooo! Where did you find that bright yellow cake pan? Hi Val, I got it at target, actually! Yes, hooray for the coffeeshop! This buckle sounds perfect with all the coffee. 🙂 I can’t say there’s a lot of quince around here in California, but I’m curious to try it! Autumn, this cake looks lovely. I am all about finding new ways to use quince! As usual, this looks delicious. I’ve yet to try quince, but after all that pie the other night, I’m really liking the idea of a buckle. Perhaps I will play with the latter before getting acquainted with the former. Coffee shops are important for me to escape into a world of anonymity where I can sit back and observe everyone else when I need an escape… or the perfect place to sit over a wide mug of frothy chai with a familiar face and catch up on the last year since we last met. Hi Autumn! The cake looks amazing, and it’s perfectly timed – I saw quince at the farmers market this morning, bought some because they looked and smelled so good, but wasn’t sure just yet how to cook them. 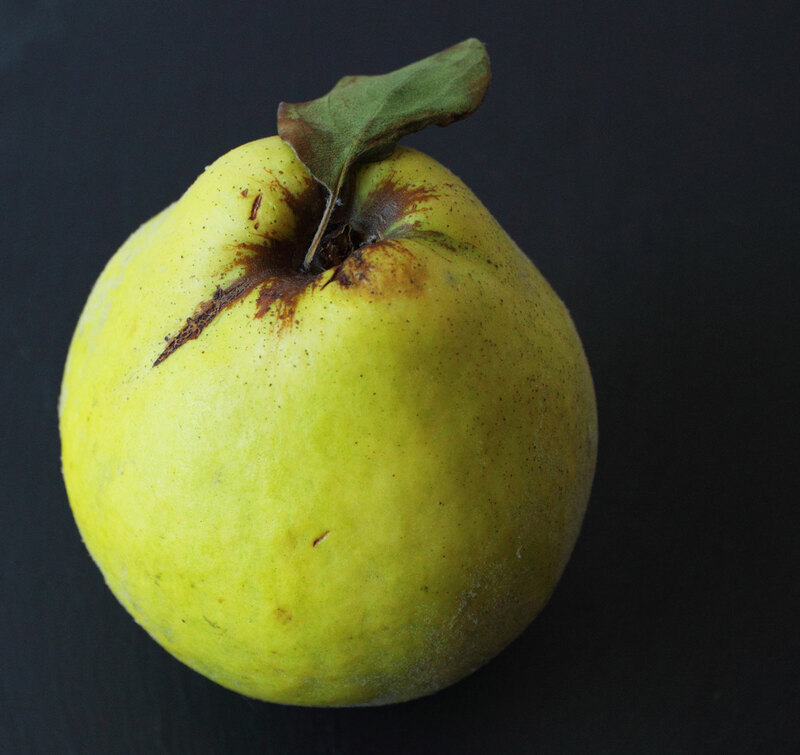 The recipe sounds like a great way to try out quince. Absolutely beautiful! 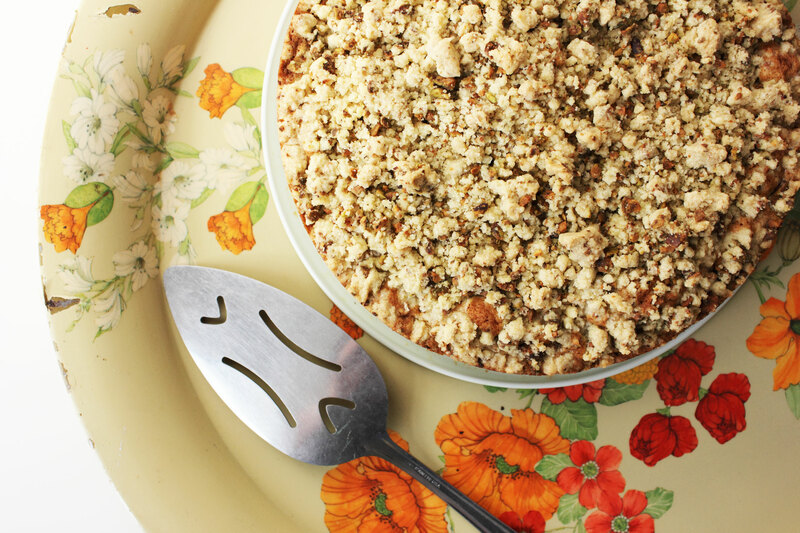 I love the combination of quince & pistachios & ginger. I can’t wait to give this a try! I enjoy coffee shops as well, I’m so grateful that my city has an abundance of different shops. I have a coffee shop where I can hang out and read magazines for several hours, I have a shop where I can stop in for the BEST cappuccino in town, I have a shop where I can sit and watch punk rockers congregate… etc. It’s great. Thanks, Sara! I love your different coffee shops for different moods.